Du Noon shop owner Peter Mpofu was having a beer in his shop on Sunday late afternoon when he heard a sudden screeching of tires followed by a loud bang. Mpofu stepped outside and couldn’t believe what he was seeing. All his furniture that he had been displaying on the sidewalk, worth R5000, was smashed up by a drunk taxi driver who veered off the road and hit a parked car before ploughing through the furniture and ending up crashing into a shipping container. Angry residents surrounded the taxi but the driver escaped by jumping over a fence and running for his life. 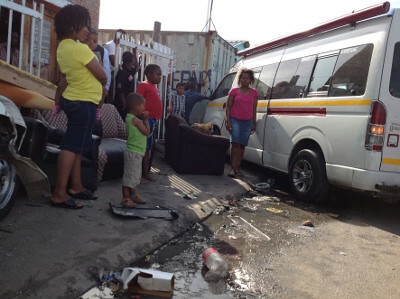 Owner of a popular nearby African food eatery, Nomhle Khoza, said she had seen the taxi swaying across the road almost running over a group of children. Moments later she saw the accident happen. While two police officers were at the scene another man came and towed the taxi away, police gave chase and forced him to bring it back to the scene. Owner of the taxi, Thandoxolo Totwana, said he was very upset with his driver. Totwana, who operates under Langa Taxi Association (LTA) which is affiliated to taxi umbrella body Cape Amalgamated Taxi Association (CATA), was Monday buying vehicle spares parts in Nyanga township to repair his damaged van. He said when the told the driver he was drunk at the time of the accident the driver threatened to shoot him, he said.